When you think of Destin FL water sports, you probably think of waverunners and those types of activities. That is definitely a lot of fun, but if you want something a little bit more exciting, I have some Destin FL water sports for you. These water sports are perfect for adrenaline junkies. If you want to feel a rush of excitement, check these water sports out the next time you’re in Destin. Windsurfing is one of the most popular Destin FL water sports for adrenaline junkies. This sport combines surfing and sailing to create one adrenaline filled ride. You will get on a sailboard that has a moveable mast. You can move the mast to catch the wind and fly across the water. Be sure to take some lessons before you hop aboard your sailboard. Otherwise, you could end up wiping out more than riding waves. You have probably seen people flying above the water doing some parasailing during your Destin vacation. If you decide to do this, you’ll get strapped into a parachute and fly above the Emerald Coast. You can go as high as 1200 feet while parasailing so this is definitely an adventure to remember. Flyboarding is possibly the most exciting of the Destin FL water sports for adrenaline junkies. 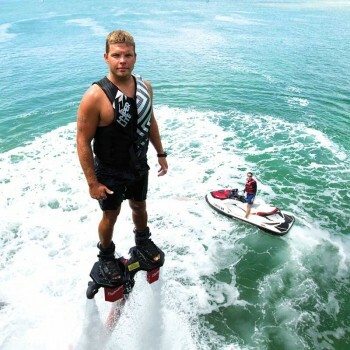 You will get on a flyboard that’s connected to a jet ski or another type of watercraft. The watercraft will push water through a hose that is located under your feet. This will make you fly through the air. If you decide to go Flyboarding, you should take lessons. Fortunately, we have a way to get a deal on your lessons. Now you’re ready to find the water sport for you. Leave a comment if you have another idea for an adrenaline producing water sport.